The pupils in school are divided into four houses - Dufton Pike, Great Dun Fell, Murton Pike and Knock Pike. These are mixed age groups of approximately twenty two children and each house has a captain and vice-captain (normally Y6s) voted for by the other pupils in Class 4. 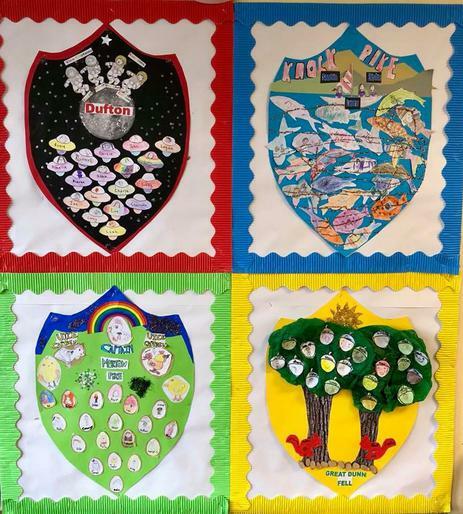 They meet together at least half termly for house activities such as the annual Sports afternoon, Children in Need, Shield making, Easter activity morning and team-building challenges. This year Dufton Pike won the house Sports cup. The pupils worked in their houses to raise money for Children in Need - £585 in total.